The scholar and philanthropist Rabbi Mattityahu Strashun inherited a library from his father, Rabbi Samuel Strashun, to which he added his own collections. With all his sons tragically passing away in their youth, Mattityahu Strashun decided to bequeath his library to the Vilna Jewish Community. He situated the library in a house on Glaziers' street, registered it in the name of three of his colleagues, and fixed a salary for a supervisor. A catalogue entitled Likutey Shoshanim (A Gathering of Roses) from the end of the 19th century listed some 5,700 works, but the number of books and periodicals in the library was much larger, as all the editions of each journal appeared under individual titles. The library had dozens of incunabula (ancient and rare manuscripts), hundreds of volumes of responsa, and 1,000-2,500 books of Judaica in various languages. Those in charge of the library debated whether to allow access to the library by the general public out of fear that the secular books would "increase the abandonment of the Torah," but in 1893 they succumbed to pressure and opened its doors. In 1901, the library moved to a building erected especially for it next to the Great Synagogue, uniting with the S.Y. Finn Library. The Russian authorities allowed it to open on condition that it did not house Polish books. The library was kept open on Sabbaths and Jewish holidays, except for the "Days of Awe." 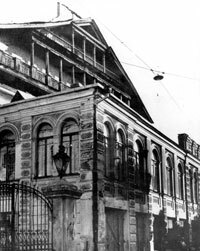 In 1909, the library was described in the Vilna newspaper Echo of the Times as "the spiritual centre of the all the wise men of the time, of all the young people that yearn and thirst for the wonderful past, of all those that seek the word of God and the wisdom of the Jewish people throughout generations and time. The spirit of the Jewish people flickers between the walls of the Great Synagogue, and those who enter it feel part of a genuine national Jewish atmosphere." Most of the educated people in the city bequeathed books to the Strashun Library. The Vilna University Library also gave many books of Judaica to Strashun. In 1928, the Library contained 25,000 titles, and in 1931 – some 33,000. Upon its establishment, the YIVO Yiddish Scientific Institute opened a library and by 1938 had collected some 40,000 titles, including journals, books and rare manuscripts. In 1910, the "Association to Disseminate Enlightenment" bought thousands of books from the "Bnot Zion" and "Hatchiya" associations, and established a library consisting mainly of books in Russian. This library, too, expanded due to donations from other libraries, and became one of the largest Jewish libraries in Poland in the interwar period. The Sirkin Book Store maintained a large lending library for foreign-language publications. The manager of the library, G.L. Einsenstadt, prepared a catalogue of thousands of titles from the history of Russian literature, beginning at the turn of the 19th century. Vilna also had a large Government Library, with most of its readers hailing from the Jewish community. The editorial board of the local newspaper Vilenski Vestnik maintained a reading room, where the majority of readers were Jewish. Neighbouring the Vilna Yiddish Education Network (TSBK) was a children's library which grew over time.